Anybody who has worked in a corporate environment knows that it is hard for humans to collaborate for teamwork. In fact, organizational psychologist J. Richard Hackman has stipulated that five conditions need to be present for collaboration to take place in a workplace. Granted you have those five factors, what else do you need to make your team members work together efficiently and productively? In this article, we provide 4 effective collaboration strategies that you can implement. These tactics have been gleaned from top-performing teams and businesses. They are guaranteed to motivate even your jaded team members and improve their quality of work. If you are talking most of the time at your team meetings, it means no one is collaborating. Therefore, you should allow all team members to express their views and opinions freely. A Google study on team effectiveness found that employees who are allowed to talk freely are more likely to persevere with the company, more likely to use creative ideas to improve their work, boosted the company’s revenue, and were more effective in completing their tasks. That is why agile teams hold daily standup meetings where everyone is empowered to speak about their work and challenges. Shy or quiet employees who don’t talk a lot are encouraged by peer pressure as everyone is given a chance to leave their shells and participate openly. You should provide psychological safety to all participating talkers and give them a feeling of security. Make sure no one is mocked or shut down rudely when they speak. Ensure the environment is secure so that people contribute meaningfully to the discussions. This can pave the way for smooth collaboration in your team. If your team members do not offer new ideas or innovations, it means they want to play it safe and not take any risks. They might be scared to come out with creative ideas fearing reprimand or criticism. Your team members may fear they might get blamed if their suggested process fails. In such an environment, people are likely to stick to tested formulas even if they are not highly successful. They may think that status quo and safety are preferable to trying drastically different ideas and getting ridiculed for them. The problem with this safe approach is your team will not be able to innovate to cater to customer demands or boost the business velocity. The solution is the team leader should lead by example. He or she should be able to take risks personally as well admit their mistakes when they fail. This will encourage your team to follow your lead. Therefore, create an encouraging and safe atmosphere to embolden your team to contribute adventurous new strategies. In a work management survey of more than 1,400 office employees, 49% stated that they experienced work-related stress due to unrealistic goals for projects, while 44% gave the reason as unclear task accountability. Therefore, it is clear that you should make all tasks, responsibilities, assignments, deadlines, and goals transparent and clear to relieve the stress of the unknown. This will tell your team where they stand because you have clarified what you expect from them. The benefit is your team is freed from tension and they can now work on their tasks without worrying about uncertainty. To motivate employees to do their work effectively and to make them happy, author Daniel Pink suggests that team managers should use three factors: greater purpose in their work, mastery of skills, and worker autonomy. Therefore, have a meeting with each team member and inform them personally how their daily work contributes to larger team and organization goals. This will imbue them with a sense of purpose as they can see how their tasks contribute to a larger cause. They will then be motivated to perform high-quality work and collaborate selflessly with other team members. Very few companies practice all these strategies and the main reason is they don’t have fearless leaders who are willing to stand up and provide a healthy work culture for smooth collaboration. You can distinguish yourself from this herd by taking a stand, being bold, and leading from the front. Now that you are clear about what collaboration strategies to implement, use the following Wrike features to collaborate seamlessly to improve productivity and execute faster across distributed teams. 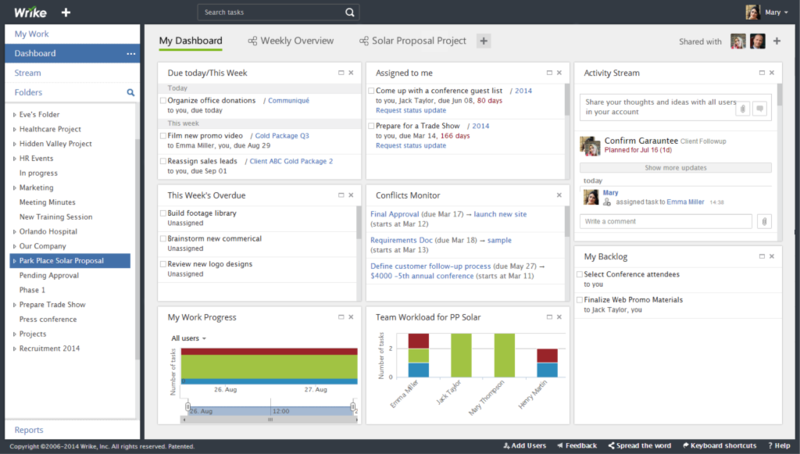 You can also read more on creative project management features offered by Wrike in a separate article. @MENTION the team members you need to get the job done and they’ll instantly see your message in their workspace. Need to share it with a client or consultant for feedback? No issues as Wrike lets you communicate and share tasks with people outside your company too. Your place to manage individual work. Consolidate to-dos from all of your projects as well as tasks that aren’t part of a project. Effortlessly manage your daily work by placing tasks in “Today”, “This week”, “Next week”, or “Later”. Simplify feedback and approval cycles with full context. Highlight sections of documents, videos, and images to add comments and eliminate confusion, delays, and re-work. Get timely approvals while maintaining a system of record. A real-time feed of updates on all project activity that provides instant status reports, and minimizes meetings and email communication so you can focus on important work. Keep teamwork flowing. Update tasks and provide feedback even when you’re on the go with the native Android and iOS apps. Stop using email as your to-do list and seamlessly send them to Wrike to transform them into tasks. Synchronize tasks and milestones to virtually any calendar including iCalendar, Outlook, and Google.